New York - April 26th, 2011 - Sumthing Else Music Works, Inc. proudly presents Warhammer® 40,000®: Dawn of War® II The Complete Soundtrack featuring the original music scores from the sci-fi fantasy real-time strategy video game series Dawn of War® II developed by award-winning Relic® Entertainment, a division of THQ Inc. The 2-disc album includes the music from Dawn of War II®, Dawn of War II®: Chaos Rising™ and Dawn of War II®: Retribution™ composed by virtual orchestra maestro Doyle W. Donehoo. The Complete Soundtrack is scheduled for release on May 24th, 2011 to retail outlets through Sumthing Else Music Works www.sumthing.com, and for digital download at www.sumthingdigital.com, Amazon MP3, iTunes® and other digital music sites. Dawn of War® II is set in the dark and grim distant future of 40,000 AD, and the galaxy is aflame with endless war. Humanity is led by its immortal Emperor and defended by vast chapters of Space Marines, elite armored super-soldiers. Mankind, which is in a steady state of decay, is beset on all sides by hostile alien races, some of them bio-engineered for war, some on their own path of decay or growth. In the game, you are in charge of units attempting to stem the tide of alien hoards and corrupted Space Marines. "It is a privilege to score for the vast Warhammer 40,000 universe with its stunning cinematic visuals and broad strokes of emotions," says composer Doyle W. Donehoo. "This iconic franchise begs for huge themes and high drama, and that is what I have aspired to for Warhammer 40,000: Dawn of War II." 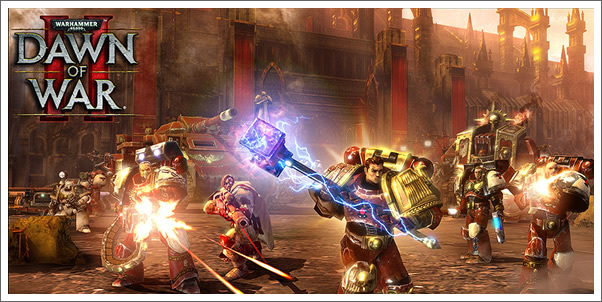 Dawn of War® II won the 2010 Canadian Videogame Award for Best Audio and Dawn of War® II - Chaos Rising™ is nominated for the 2011 Canadian Videogame Award for Best Audio. For more information on Warhammer 40,000: Dawn of War II, please visit www.dawnofwar2.com.